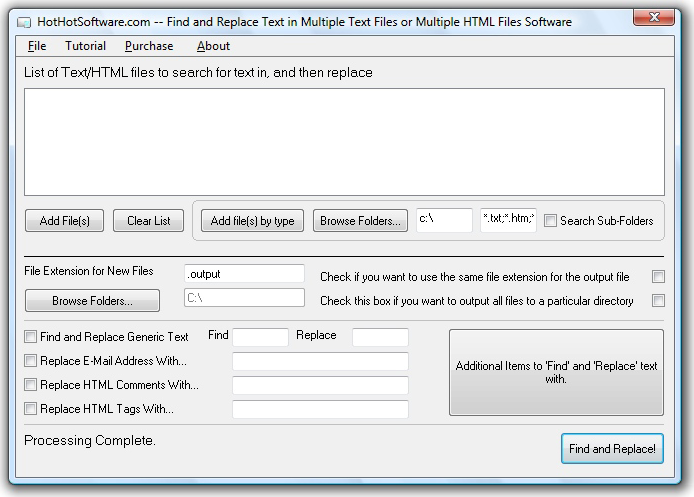 Find and Replace Text in Multiple Text Files or Multiple HTML Files! Making a website with HTML or using and HTML generation program is a relatively simple way to make sharp, professional looking website. But HTML is literal to a fault --one wrong bracket and your whole site can turn into a mess of half-code half-text drivel! So, making changes in those pages can be hours, even days of tedious reading and retyping. Using simple queries and regular expressions, Find and Replace Text in Multiple Text Files or Multiple HTML Files lets you replace whole lines of code in a few short clicks. Whether it's content, format or style, or just bad code grammar, Find and Replace Text in Multiple Text Files or Multiple HTML Files makes adjustments almost instantly. As titularly implied, Find and Replace Text in Multiple Text Files or Multiple HTML Files is also a valuable tool for dealing with large text documents. Ever realize you got somebody's name wrong in a fifty page report then stayed up all night fixing the ubiquitous error. Find and Replace Text in Multiple Text Files or Multiple HTML Files gets you out of that fix. A simple and effective program that no one should be without. Find and replace text - using simple queries or regular expressions. Find all relevant files quickly - using Find and Replace Text's advanced search engine, you can modify searches by file type, folder and sub-folder. Stay organized - Find and Replace Text let's you store all new files in a separate folder, preserving your old drafts and helping you stay organized. The homepage says the app cost $49,95 and it's now reduced to $29,95 .. lol...lol... come on $50 for that? ..no way. It features VBS regex only!!! I will visit your forum and....oh, there is no forum? 1. Yes, the file size is smaller, to provide an incentive to get the full version. 2. It asks you to enter your e-mail address for a newsletter when exiting the program. 3. Yes, it does feature Regex that other softwar doesn't have, what else were you looking for?